MEMPHIS, Tenn. (localmemphis.com) – The new Crosstown High finally opened its doors to their inaugural freshman class this week. According to Principal Chandra Sledge Mathias, students can look forward to a curriculum-based around partnerships with over 40 local businesses within Crosstown Concourse. “The partners in this building are really excited about working with our students, which is incredible because we’re not having to beg people to work with teenagers. They’re open to that and they’re excited about sharing what they’ve learned in their professions with our students,” says Mathias. The staff at Crosstown High is thinking outside the box when it comes to their project-based learning curriculum. “Our teachers are developing curriculum and they’re working with partners at MIT and Eagle Rock Professional Development Center in Colorado. We have a support team that’s really helpful when we’re thinking about how do we take these innovative projects and make sure there’s still a deeper learning aspect,” says Mathias. Parents beware. Crosstown High’s first freshman class of 150 was selected from a lottery of over 300 applicants. The already popular school will be enrolling an additional 3 freshman classes over the next 3 years until they arrive at capacity. 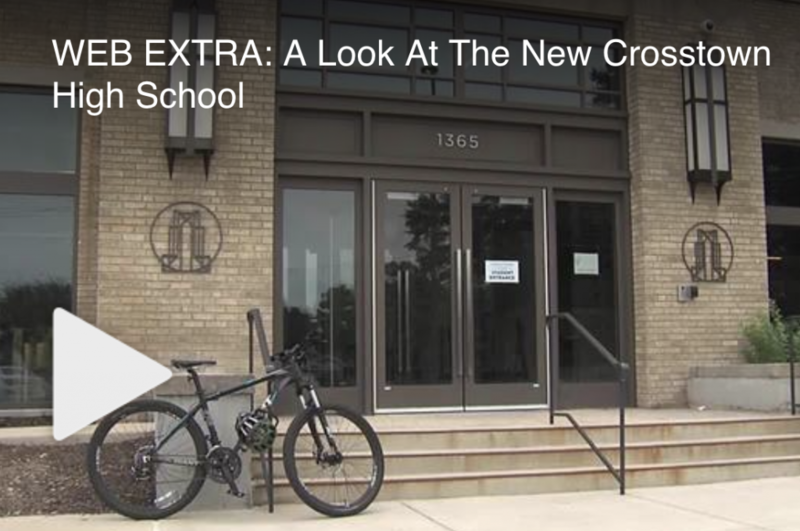 If you’d like to learn more about Crosstown High, CLICK HERE.